News just in from Bob McKeage at International Yacht Collection that the price of Trinity's 49.07m Lohengrin has been dramatically reduced. 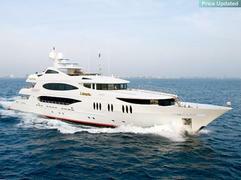 An all-aluminium motoryacht built in 2006, she accommodates 10 guests in a master, three doubles and a twin. ABS classed and MCA compliant, Lohengrin has had a $3.4 million price cut and is now asking $29.5 million.